The three state regional NRM’s (NRM North, NRM South, NRM Cradle Coast) have worked with the University of Tasmania and Birdlife Tasmania to develop information and resources for coastal saltmarshes, including community based monitoring projects, identification resources and detailed maps for all saltmarsh clusters across southern Tasmania. Saltmarsh was declared an Ecologically Vulnerable Community under the EPBC Act in August 2013 and community monitoring is important for saltmarsh conservation efforts as there is a lack of detailed data on the diversity, condition or values of saltmarsh in Tasmania. School groups, professionals and coastal groups are encouraged to conduct monitoring around October-April. 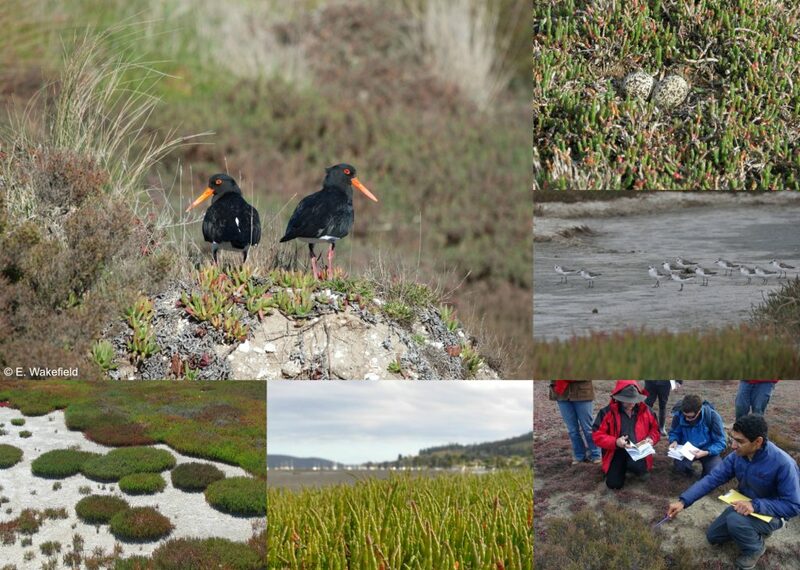 NRM North and UTas have developed monitoring sheets to collect information on the composition of wetland plants in saltmarsh areas, bird observations and human impacts (see relevant checklists in the resources sidebar menu). NRM South and Vishnu Prahalad from University of Tasmania, have developed a series of user-friendly guides to provide step by step instructions on how to use the Saltmarsh Matters App. 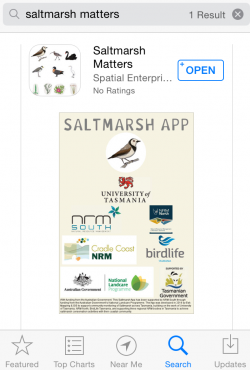 NRM South have funded the development of the Saltmarsh Matters App by Esk Mapping & GIS with the support from UTAS, BirdLife Tasmania and NRM North. 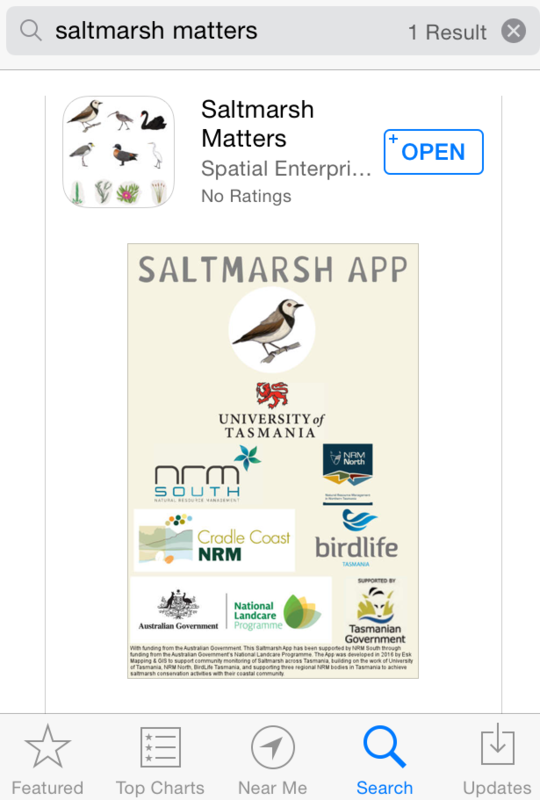 This app was officially launched by University of Tasmania’s Distinguished Professor Jamie Kirkpatrick as part of our World Wetlands Day Celebration 2016. To build on data of the state’s Saltmarsh, NRM South have completed mapping of coastal saltmarsh with UTAS. This information indicates a large extent of saltmarsh across southern Tasmania. However, there is little data on the diversity of saltmarsh (species composition and reliant fauna) and condition in Tasmania. 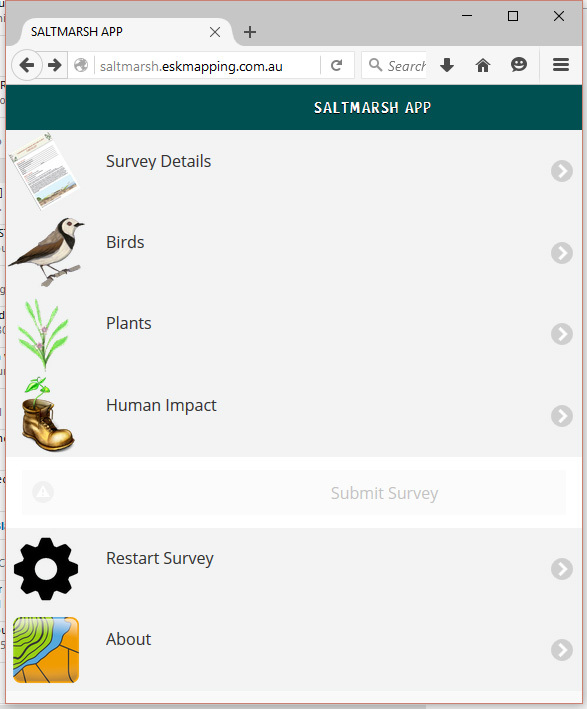 The Saltmarsh Matters monitoring project from 2015-18 seeks support of community groups, schools, local government and other coastal volunteers to submit regular monitoring of local saltmarsh via the Saltmarsh App. 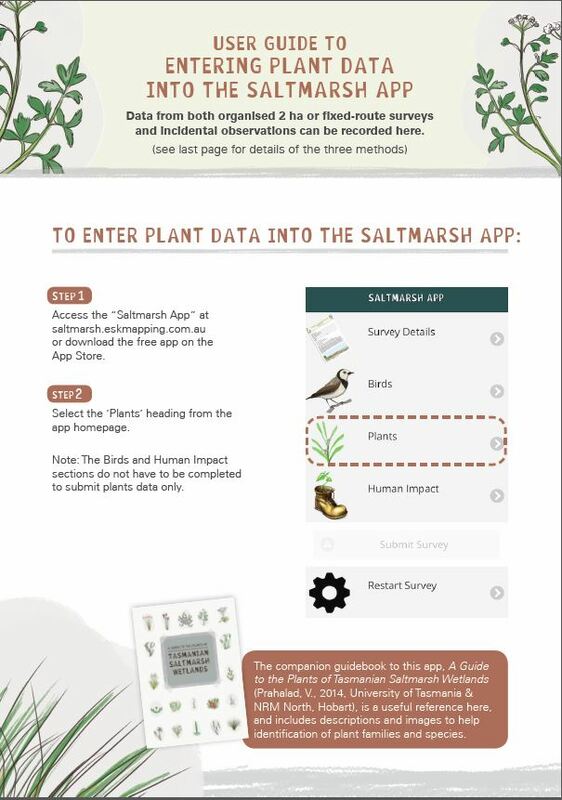 This will collect data for species diversity (Plant Checklist) which supported by a field guide-Saltmarsh ID Guide, bird diversity(Bird Checklist) and condition (Human Impact Checklist) and can also be collected/data entered via the Saltmarsh App. Open the App on your device and Bookmark it. Open all the pages while you are online, then you should be able to easily open it while offline in the field. Data can be submitted when you are connected to the internet.